Airline workers have grown accustomed to working long hours in terrible weather. They are comfortable in high-stress, time-sensitive situations where the margin for error almost does not exist. It should come as no surprise, therefore, that airline workers were often at the forefront of community responses to Harvey. Here are a few of their stories. About an hour before daybreak on Monday morning, August 29, the San Jacinto river reached Kingwood, Texas. The floodwaters, which had been partially controlled by a network of Texas bayous, suddenly broke free, and destroyed dozens of homes in a nearby apartment complex. 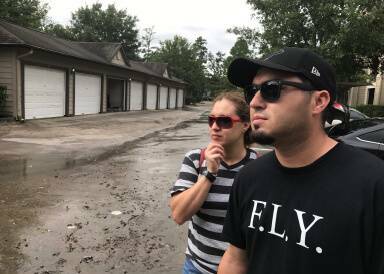 IAH Ramp Agent, Jo Angel Hernandez and a friend began waking residents, alerting still sleeping families to the danger. They were soon joined by fellow United Ramp Agent and IAM141 member, Nate Kardachi, who also helped them push disabled vehicles through the rising water to safety. Together, they were able to prevent the destruction of at least 30 cars in their apartment complex. Unfortunately, while helping to save so many of their neighbor’s vehicles, Jo and Nate both lost their own homes to the flood. Jo Hernandez also watched as his mother’s home was inundated in the creeping, relentless water. Rather than simply ride out the storm, volunteers like Steve Dovi helped rescue their neighbors. 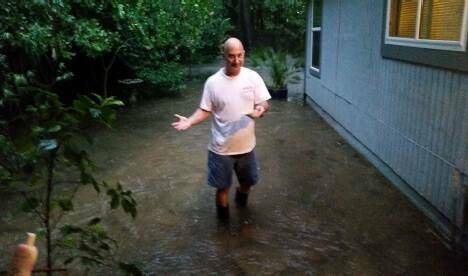 Steve Dovi, a member of Local 811 in Houston, set out to help people. Together with other volunteers, Steve was able to successfully rescue evacuees ranging in age from infants to the elderly. Flooding is a nearly silent, deceptively slow moving disaster. It is very easy to underestimate the danger posed by flooding. Without help from alert volunteers like Steve, Harvey would have been even more devastating to Texas residents. Rey Hernandez helped save his community. 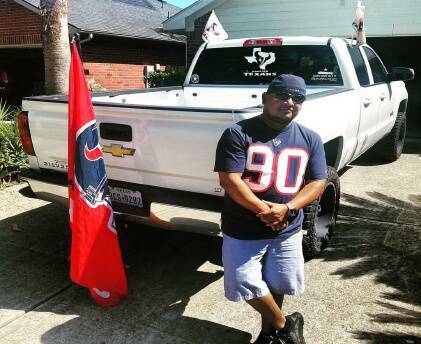 Rey Hernandez is member of Local 811, a Ramp Lead and a proud Houstonian… who just happens to own a truck with a 6-inch lift and a boat. Those elements combine to create someone that isn’t willing to let a flood wipe out his community. Rey used his boat and his high-profile truck to rescue over 100 people in 3 days and get them to shelter. “I had to help, and 6 feet of water wasn’t going to stop me,” Rey said. 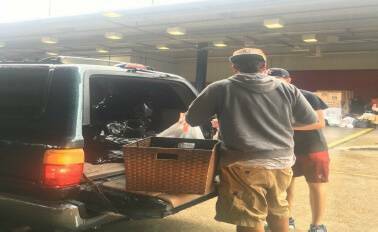 Brother Kevin Bejerano organized his neighbors in a donation drive to help those in need. He is a Member of local 811. 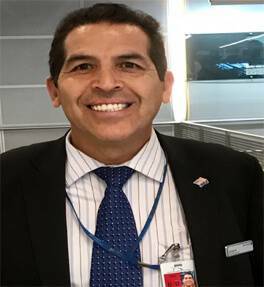 Jorge Revuelta is a United PCE agent at IAH, and a member of local 2198. On August 28th, Jorge set out from his Woodlands, Texas, home to help his neighbors. At 9:00 Jorge got a call from his son in law telling him that they needed to help out in a nearby neighborhood. They grabbed their boat and headed out to the flooded streets, facing water more than 7 feet deep. They first rescued an elderly couple who gave them a bottle of vodka. Naturally, they accepted the gift…because they didn’t want to be rude. Throughout the day, Jorge and his son in law saved more than 20 families. Most of the evacuees were elderly people and their pets. Jorge had joined a small fleet of rescue boats that had formed to help the community escape the rising water. Jorge’s hard work and leadership attracted the attention of television crews, and he was featured on Fox 26 Houston. Firefighters showed up 4 hours after the community had started rescue services. Jorge recounted that, at the end of the ordeal, he was almost to the point of collapse; seeing so many people lose so much had taken a painful toll on the volunteers. 80% of the endangered families in that area were saved thanks to help from Jorge and the other volunteers. Most of the rescued families were on roofs and second floors. There is currently an ongoing and critical need for emergency assistance in the Houston area. Please visit the IAM Disaster Relief Fund page or an EAP Peer Coordinator to find out how you can help. We are looking for stories of IAM141 members helping to make the world a better place. If you know of a story that you would like to share with us, please contact the IAM141 Communications Department at info@IAM141.com, or call (224) 239.3496 and tell us about it.